A land-use plan for the Sacramento Kings downtown arena project envisions three mixed-use areas of residential, retail and office use directly north and west of the planned arena site, all of them along J Street and between Fourth and Seventh streets. In a planning document submitted earlier this week and released by the city’s planning and development department after 5 p.m. on Friday, the site would have retail and commercial uses on the first floor of the buildings, up to 350,000 square feet. Another 475,000 square feet would be designated for office space, and there would also be as many as 550 multifamily residential units, in two or more towers on the site, for a total of half a million square feet. Though not specified for a particular spot within the area to be developed, a 250-room hotel would also be included, as well as several open spaces. The application describes development of what it calls the Entertainment and Sports Center Planned Unit Development site over three phases, on 8.35 acres, though timing of each phase is not specified. 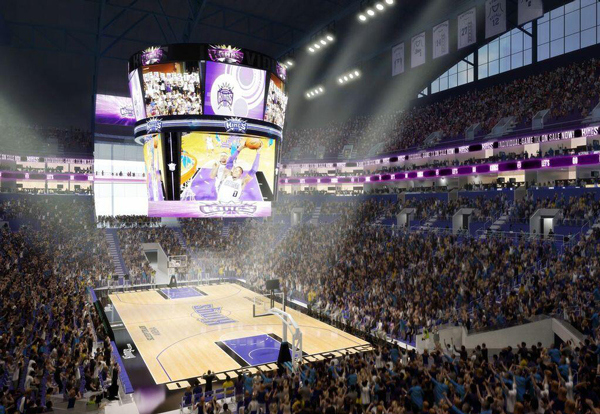 The arena, which is at the center of the ESC-PUD, is envisioned as significantly larger than the Kings’ current arena, at 1 million square feet versus 442,000 square feet for Sleep Train Arena in Natomas. The basketball court would be on a northwest/southeast axis inside the building. Among the four principles used as a basis for project design are regional visibility, location efficiency, cultural efficiency and architectural response, the application states. The development application is up for its first review before the city’s planning and design commission on Dec. 12, and is set for hearings before the Sacramento City Council in April. Demolition on the portion of Downtown Plaza to be replaced by the arena and surrounding development is set for next summer, with arena construction to start by October 2014.